Welcome to Hertz international car rental website! Hertz locations in USA, Canada, Austrlia, UAE, most countries in Europe and Asia( excluding Japan and Korea) now accept China Driver's License when it is accompanied with an English translation, FREE TO APPLY NOW! Please contact Hertz China Call Center 400 921 1138 or follow Hertz China official Wechat "HertzGuoJiZuChe" to apply online. Please Note: An English notary certificate of China Driver's License is required for self driving in New Zealand, Greece and Russia. Please contact your local notary office to apply. We look forward to assist you with Hertz car rental worldwide. Drive the world with Hertz! PLEASE NOTE: During reservation, No Deposit/No Modification/No Cancellation Fee is required (unless otherwise specified). GPS is available at most Hertz locations worldwide and is bookable during reservation. Hertz can provide GPS with Chinese language at its locations in North America, Australia and New Zealand. If accident happens, please call Hertz 24 hour emergency roadside assistance. The emergency number can be found on the key ring and rental agreement. Below is brief summary of insurance provided at some of Hertz locations worldwide. For more details, please visit Hertz website or Hertz counter at car pick up. In California, Maryland, Massachusetts, Michigan, New York, South Carolina, Virginia, or West Virginia, Hertz provides primary liability protection up to the statutory minimum limits. Liability Insurance Supplement (LIS) is primary protection, which provides the first USD 1,000,000.00 of combined bodily injury and/or property damage protection for each occurrence. Hertz offers Loss Damage Waiver (LDW) as an optional service, which for an additional daily charge relieves you of all financial responsibility for the loss or damage to the rental car, whether or not you have insurance to cover such damage, provided the car is used in accordance with the terms of the Rental Agreement. The cost of LDW may vary depending on location or car type and is charged per each full or partial day of rental. Personal Accident Insurance (PAI), offered in combination with PEC, allows you to elect accidental death and accidental medical expense coverage for yourself and your passengers during the rental period of the vehicle. Personal Effects Coverage (PEC), offered in combination with PAI, is an option that insures against risk of loss or damage to help protect your personal belongings while renting from Hertz. Liability protection up to a single limit of CAD1 Million per accident for bodily injury or property damage combined, is included. LDW is an optional service which relieves you of any responsibility for the loss of or damage to the rental car resulting from any cause, provided the car is used in accordance with the terms of the Rental Agreement. Cost of LDW may vary depending on location or cartype and is charged per each full or partial day of rental. UMP covers the bodily injury sustained by the renter, family members and passengers travelling together in the rented vehicle, caused by another driver who has no insurance,minimal insurance, or is a hit and run driver. UMP provides up to USD1,000,000.00 of Uninsured/Underinsured protection for bodily injury sustainted while giving the rental vehicle. UMP is only available when first accepting Liability Insurance Supplement(LIS). In states where UMP is offered, LIS does not contain any Uninsured/Underinsured Motorist coverage. In state where UMP is not available, Uninsured/Underinsured Motorist coverage up to USD 100,000.00 is included with the LIS coverage. PAI is an optional coverage for any accident involving death or bodily injury during the car rental covering you and your passengers. PEC is optional insurance for the loss or damage to Personal Effects of the renter and any companions travelling together in the rented car. Personal Accident Insurance and Personal Effects Coverage have a combined rate. They are not sold separately. PAI/PEC is not available at locations in the provinces of Alberta and Quebec. The maximum coverage per person is CAD 500.00 with a deductible of CAD 25.00. Maximum coverage per rental of CAD 1500.00 per person. In most European countries, basic insurance includes unlimited coverage on bodily injury to persons other than the driver and property damage to anything other than the Hertz vehicle, except in Italy where max coverage is 7.5 million Euro and 2 million Euro in Netherlands. CDW is an optional service which, if accepted, reduces your financial liability for damage to the Hertz vehicle, its parts and accessories, except for theft, attempted theft or vandalism, provided the vehicle is used in accordance with the terms and conditions of the rental agreement. CDW may be mandatory and included in some contract or preferential rates. If CDW is declined, you will be responsible for the amount of the deductible. TP is an optional service which, if accepted, reduces your financial responsibility for loss of, or damage to the Hertz vehicle due to theft, attempted theft or vandalism, including its parts and accessories, provided the vehicle is used in accordance with the terms and conditions of the rental agreement. TP may be mandatory and included in some contract or preferential rates. If TP is declined, you will be responsible for the amount of the deductible. 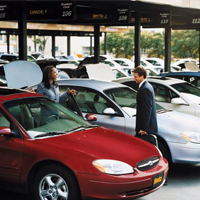 If you opted for, or if your rate includes Collision Damage Waiver (CDW) and Theft Protection (TP), you may also wish to purchase an additional protection, "Super Cover", to waive your already limited liability in case of damage to, or theft of the Hertz vehicle, its parts and accessories, including those losses resulting from collision, vandalism, theft or attempted theft, provided the vehicle is used in accordance with the terms and conditions of the rental agreement. Super Cover is not available for customers on business contract rate rentals unless there is a CDP code present that indicates that this option is applicable. Super Cover does not cover broken / loss of keys, contamination of fuel or Hertz NeverLost navigation units. Super Cover is offered in most locations but can only be purchased at time of pick-up - Please contact your Reservation Centre for availability. Covers yourself, your passengers and your personal effects. Terms and conditions may apply, please refer to the insurance leaflet at the rental counter. If the rental vehicle is damaged in a Single Vehicle Accident (an accident not involving a collision between the rental vehicle and another vehicle, other than a parked vehicle), you are liable for the cost of repair up to the amount of the ADE plus AUD $2200 (inclusive of GST). This currently applies to all vehicles at all locations and can be waived with the purchase of Maximum Cover at participating locations. SVA DOES NOT APPLY TO TASMANIA. TASMANIA HAS A NON-WAIVABLE AUD $9900 EXCESS ON UNSEALED ROADS. Reduces the amount of accident damage excess. Excess buy out. Capped at 10 days per 30 day rental period. Available at participating locations. Rates include LDW which provides cover for theft and/or damage to the Hertz vehicle and/or Third Party Property, as long as you comply with the rental terms and conditions. Hertz provides $5,000,000 liability cover toward property belonging to a 3rd party excluding passengers in the Hertz vehicle. In the event of damage, an Accident Damages Excess (ADE) will apply per incident regardless of fault. This is the amount the renter contributes towards the loss or damage. The ADE is currently NZD3450.00 (inclGST) for the economy manual, compact manual, compact auto, intermediate auto and fullsize auto car classes, and NZD4025.00 (incl GST) for the premium wagon, 4WD, luxury 8 seater, luxury sedan and premium 4WD car classes. Excess amounts may vary so please check at time of reservation. If damage has occured, the full ADE amount will be charged to the renter's nominated Credit Card, should the renter choose not to reduce their excess with either Renter Protection Package (PKG) or Accident Excess Reduction (AER). Once the vehicle is returned, should no damage have been incurred, no excess will be charged. Cash hires are required to leave the full ADE amount, plus a bond of NZD300 at pickup, should the renter choose not to reduce their excess with either Renter Protection Package (PKG) or Accident Excess Reduction (AER). Once the vehicle is returned, should no damage have been incurred, the cash or a cheque will be returned to the renter. PAI is available at all Hertz locations and provides the authorised driver and/or passenger/s, compensation for accidental death or bodily injury caused by an accident in connection with the rental vehicles. PAI provides benefits up to a maximum cover of NZ$100,000 (The Compensation) for accidental death or bodily injury for the authorized driver and/or passenger/s (exclusions apply). The maximum amount payable for a passenger shall be 10% (Ten Percent) of The Compensation and the balance of the compensation shall be payable to the authorised driver. PAI cost* is NZ$5.75 incl GST per day. *Corporate rates may vary so please check at time of reservation. Personal Effects Cover (PEC) - PEC provides benefits to the authorized driver and traveling companions for loss or damage to baggage and personal belongings. PEC cost* is NZ$5.75 incl GST per day. 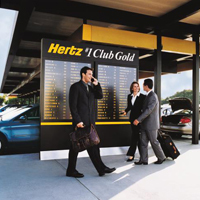 Hertz Gold Plus Rewards Membership – Join Today for FREE! At over 45 airports and 1,000 Hertz locations worldwide, enjoy the fastest car rental service. Booking with your Hertz membership ID# , No long queues. No unnecessary paperwork. You just go straight to your car and drive away. Return without waiting, electronic bill will be sent to your mail box in time. Earn points for each rental, change for free Hertz rentals and Airlines FFP miles/points. Apply Now or call Hertz 400 921 1138 to ask for an application kit. 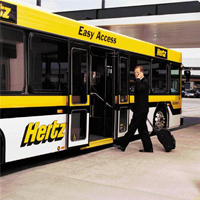 In the airport, Gold members step into Hertz Easy Access bus. Arrive Gold member parking area, find your name and corresponding car bay number. Car key is already in the car, just get into your car and go! Get more special offers to make your trip more valuable! Hertz has joined frequent flyer program(FFP) of more than 60 Airlines worldwide. If you are a FFP member of one of these airlines, you can earn FFP points/miles whenever you rent from Hertz worldwide locations. Click here to obtain a full list of airlines and their FFP reward policy. During reservation or car pick up, please provide your FFP ID#, your FFP points will be automatically recorded in your account.